If you check the December 2, 2015 post you will see that the rear hub on Art Bent’s touring rubbed against the seal causing it to fail. At the club meeting “Show and Tell” the consensus of the group was that the axle or hub was worn allowing the hub to slide too far on the tapered axle. The original Babbitt thrust washers in the differential were replaced with bronze not that long ago. When Art removed the rear hub he found the outer bearing on the offending axle did not slide all the way into the axle tube. It was poking out about ¼” from the end of the tube. When he pushed it in it hit something springy and would not stay put. Quite likely a modern inner seal was installed backward or an original felt seal was hanging up on the rivet collar in the axle tube. The modern seal is shaped like a flying saucer and the top of the saucer should be oriented toward the differential. The seal is held in place between the rivet collar inside the axle tube and the Hyatt bearing sleeve. Art dropped by and borrowed my axle sleeve removal tool to pull the Hyatt bearing sleeve so he can extract the seal. These sleeves are designed so that the arrow shaped slit faces the direction of axle rotation when the car is moving forward. Said another way, if you look at the sleeve with the arrow facing you and pointing down. The hole in the sleeve will be on the right side for the right axle and on the left side for the left axle. 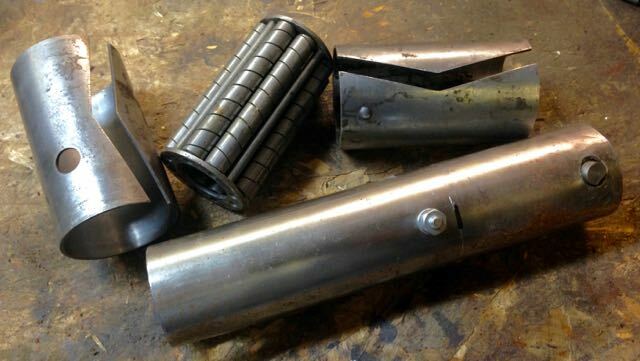 To remove the sleeve, remove the Hyatt bearing and slip the tool inside the axle tube and rotate it until the spring-loaded pin on the tool fits into the hole in the sleeve. Slip a large screwdriver or rod into the outer hole in the tool and rotate it in the direction of the shortest distance to the slit in the sleeve. It may take a fair bit of force to unseat the sleeve from the axle tube. It will be interesting to see what Art finds when he removes the seal. Is it necessary to use the inner seals if you use modern neoprene style outer seals?